AUGUST 2017 UPDATE: Here’s how to help animal shelters and rescues affected by Hurricane Harvey. JUNE 8, 2016 UPDATE: Sheriff Troy E. Nehls, who helped in the rescue, has officially adopted Archer. 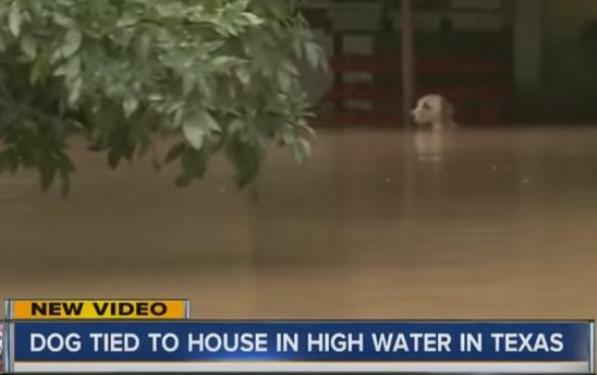 The dog’s owner, Mario Gallardo, told KPRC he didn’t realize how high the water would rise when he tied Archer to the porch and left him there — and he didn’t bother to tell authorities then that he’d left his dog behind. “They chained him to the front of the [expletive] house?” said someone in an airboat Tuesday as it made its way down a street in Rosenberg, Texas, which had been flooded by the historic rising of the Brazos River. He was referring to a dog who’d been tied to the front porch of a house. The dog was struggling to keep her head above the rising floodwater. In the airboat were KPRC reporter Phil Archer, photographer Jeovany Luna, Sheriff Troy E. Nehls, and volunteers Richard Allen and Jeff Shimek. With a camera rolling, Archer and Shimek jumped out of the boat and rescued the dog, minutes before she would have drowned. Later that day, the Houston Humane Society wrote on its Facebook page that it would get the dog “cleaned up, fed (although I hear the sheriff shared a ham sandwich with her earlier), vaccinated and settled in for the night.” Anyone interested in adopting her (she’s appropriately been named “Archer” by shelter staff) is asked to email adoptions@houstonhumane.org. Phil Archer has been reporting for KPRC for 40 years, according to his Facebook page. After taking the dog to the Houston Humane Society, he and the other heroes went back and rescued more dogs.